There are 21 counties in New Jersey. These counties together contain 565 municipalities, or administrative entities composed of clearly defined territory; 250 boroughs, 52 cities, 15 towns, 244 townships, and 4 villages. In New Jersey, a county is a local level of government between the state and municipalities. County government in New Jersey includes a Board of Chosen Freeholders, sheriff, clerk, and surrogate (responsible for uncontested and routine probate), all of which are elected officials. Counties organized under the Optional County Charter Law may also have an elected county executive. Counties traditionally perform state-mandated duties such as the maintenance of jails, parks, and certain roads. The site of a county's administration and courts is called the county seat. New Jersey was governed by two groups of proprietors as two distinct provinces, East Jersey and West Jersey, between 1674 and 1702. 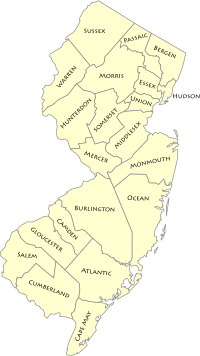 New Jersey's first counties were created as administrative districts within each province, with East Jersey split in 1675 into Bergen, Essex, Middlesex and Monmouth counties, while West Jersey's initial counties of Burlington and Salem date to 1681. The most recent county created in New Jersey is Union County, created in 1857 and named after the union of the United States when the Civil War was imminent. New Jersey's county names derive from several sources, though most of its counties are named after place names in England and prominent leaders in the colonial and revolutionary periods. Bergen County is the most populous county—as of the 2010 Census—with 905,116 people, while Salem County is the least populous with 66,083 people. Until the 1960s, the New Jersey Senate had 21 representatives, one from each county regardless of population. In the wake of the 1964 decision by the Supreme Court of the United States in Reynolds v. Sims, establishing the one man, one vote principle that state legislative districts must be approximately equal in size, David Friedland filed suit in New Jersey Supreme Court on behalf of two union leaders, challenging a system under which each county was represented by a single member in the New Jersey Senate. The senate enacted a proposal whereby each senator's vote would be weighted based on the population of the county represented, under which Cape May County's senator would receive one vote while the senator from Essex County would receive 19.1, in direct relation to the ratio of residents between counties. In a decision issued on December 15, 1964, the Supreme Court ruled unanimously that the weighted voting system as adopted was unconstitutional. The court ordered that interim measures be established for the 1965 legislative elections, in which weighted voting could be used as a temporary measure, and that the needed constitutional changes to restructure the New Jersey Legislature to be in compliance with "one man, one vote" requirements be in place before elections took place in 1967. The legislature's final decision was to establish 40 districts statewide, each represented by one senator and two assemblymembers, without relation to county boundaries. The Federal Information Processing Standard (FIPS) code, used by the United States government to uniquely identify counties, is provided with each entry. FIPS codes are five-digit numbers; for New Jersey the codes start with 34 and are completed with the three-digit county code. The FIPS code for each county in the table links to census data for that county. ^ "New Jersey – Place and County Subdivision". U.S. Census Bureau. Archived from the original on November 22, 2009. Retrieved September 6, 2009. ^ Coppa, Frank J. (2000). County government: a guide to efficient and accountable government. Greenwood Publishing Group. pp. 39–40. ISBN 978-0-275-96829-8. Retrieved August 31, 2009. ^ "An Overview of County Government". National Association of Counties. Archived from the original on April 17, 2013. Retrieved February 1, 2011. ^ a b "County Formation Map" (PDF). New Jersey Association of Election Officials. Archived from the original (PDF) on 2007-07-24. Retrieved August 30, 2009. ^ a b Torp, Kim (2006). "New Jersey County Formation". Genealogy Trails. Retrieved August 30, 2009. ^ a b Wright, George Cable (December 16, 1964). "Weighted Voting Voided in Jersey; State's Highest Court Bars Senate's Plan – No Ruling on Its Constitutionality New Jersey Supreme Court Bars Senate's Weighted Vote Plan". The New York Times. The New York Times Company. Retrieved September 1, 2009. ^ a b "County FIPS Code Listing for the State of New Jersey". US Environmental Protection Agency. Archived from the original on July 1, 2016. Retrieved May 27, 2016. ^ a b c "NACo – Find a county". National Association of Counties. Archived from the original on January 12, 2008. Retrieved January 25, 2008. ^ Hutchinson, Viola L. The Origin of New Jersey Place Names, New Jersey Public Library Commission, May 1945. Accessed November 14, 2015. ^ "American FactFinder". Factfinder2.census.gov. Retrieved 2012-08-15. ^ Greenberg, Gail (August 30, 2009). "A Brief History of Camden County". Camden County Board of Freeholders. Archived from the original on June 23, 2009. Retrieved August 31, 2009. ^ "History". Mercer County Cultural & Heritage Commission. Archived from the original on February 21, 2009. Retrieved August 31, 2009. ^ "The Land Past and Present". Morris County Board of Chosen Freeholders. Archived from the original on August 22, 2009. Retrieved August 30, 2009. ^ "How did our county get its name?". Morris County Library. July 26, 2008. Archived from the original on February 23, 2009. Retrieved August 31, 2009.